I see that you've written that you are never going to implement "Ban weightings" but I am asking if you can do it because the staff of my server i complaining so much because they are kicking/banning each other for fun (Yes I want to demote them but the other owners don't want to). This plugin is looking great. Thanks for your work! Could I make a suggestion? I would love to have a feature where you can see the most recent bans/mutes/etc../etc.. done by whom to whom. It would be good to see the lowdown of what happened when an owner of a bigger server comes online after having a bit of a hiatus. 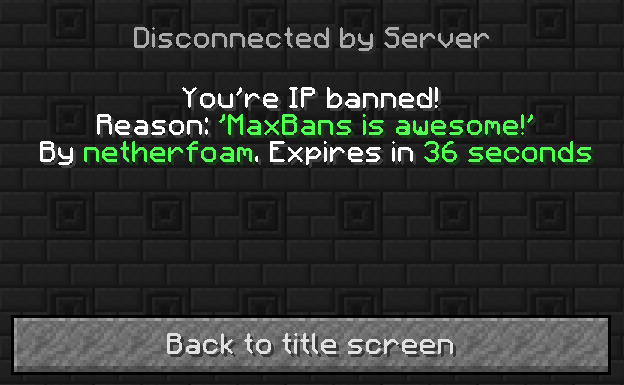 Output: Exactly the same as /checkban <Your Username>, except doesn't require maxbans.checkban permission. Deleting individual warnings, not sure if this is necessarily worth the effort with /clearwarnings, and how I've written my warning system. The time is millisecond time, I think PHP is based on second time. So just divide by 1,000... e.g. I'm guessing the timezone is in the past because the value is out of range for php integers or something.. But try it and see! I can't find anything wrong with this code so I assume it has something to do with the plugin? The mysql doesn't seem to work, whenever I ban someone it doesn't come up in the mysql, there isn't even a table. Is there any way to fix this? This option solves that problem for me. and maybe add honeypot support and make a ban reason for it if that is possible. excellent, seems to work fine.